1) You can change your Twitter and/or Facebook profile pictures to the picture labelled 'profile' below. 2) You can change your Facebook cover picture to the picture labelled 'cover' below. 3) You can click this link and then 'share' the picture on your own Facebook page. Of course, if you want to be really helpful, you can also share this blog and encourage other people to get involved! Here it is! Our trailer! Hope you like it! Don't forget that public booking is now open for our BFI run, and tickets are still on sale for our special preview at the Riverside Studios. More soon. While working on Life Just Is, we came to realise that everyone has a story to tell about entering 'the real world' after education. As Justine explains below, WE WANT TO HEAR YOUR STORIES! Post a video reply on Justine's video, sharing some of your experiences, thoughts, funny moments or heartbreaks from that time of life. This is a social experiment to get the conversation going about life after uni. We hope that by sharing these stories, we can shine a light on the issues faced by young people leaving uni today. As you can imagine, we're busy beavering away getting things ready for our release in the UK and Ireland in December, and in celebration we have a host of things planned for the coming weeks. So I thought it might be a good idea to just quickly note down what you can expect, and when you can expect it! From Education to the Abyss: Next week we'll be kicking off our video campaign, 'From Education to the Abyss'. The idea behind the campaign is to open a discussion about what happens during that awkward first year after you've finished University: we're sure that the characters in LIFE JUST IS aren't the only ones who have had life-changing (and life-challenging) experiences during that time. Launching on our YouTube Channel, we'll be inviting video responses to spark off the discussion. So, whether you have a funny story, a heartbreaking anecdote, or a terrifying tale, get ready to tell us about it! We want to hear all about your horrendous jobs, your disastrous love affairs, and your hilarious adventures… but most importantly of all, we just want to hear YOUR voice and find out what happened to you when you entered the gaping abyss of 'real' life! 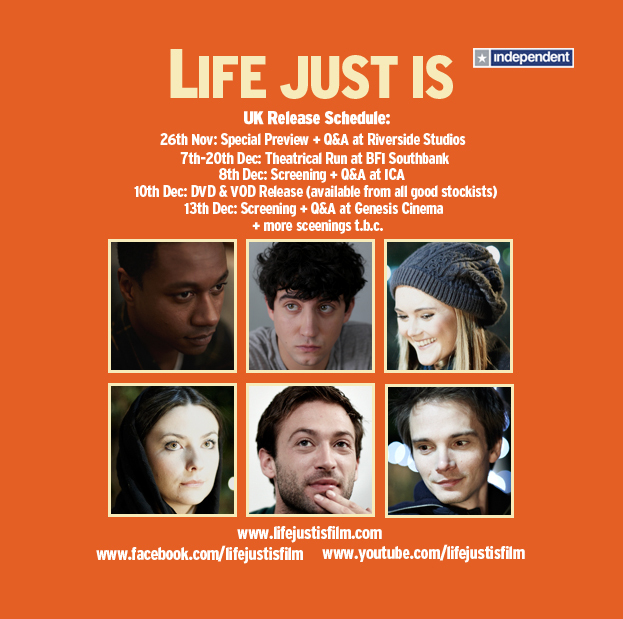 The Trailer: The moment many of you have been waiting for – the official launch of the LIFE JUST IS trailer! The Stills of Life Just Is…In Motion: As we approach our release, we look back to the shoot with a unique behind-the-scenes documentary made from the stills taken on set by photographer David Lau. I'm particularly pleased with the way this has come out and wish we'd have had it in time for the DVD… be sure not to miss it! Facebook Profile Picture campaign: A double-whammy this week! As well as releasing the video, we'll also be asking you to help us spread the word by changing your Facebook profile picture to an image with all the details of our release. As a small, independent production, we really need people like YOU to help us make our film a success. Andrew Hawley Improv: During the shoot it became apparent that some dialogue I'd written for the character of Nick (played by Andrew Hawley) wasn't long enough for what I needed from the scene. So I asked Andrew to improvise. Which he did, to hilarious effect. Unfortunately for me, the first few takes were ruined by our lead actors Nathaniel Martello-White and Will De Meo being so amused that they couldn't keep a straight face. Luckily for you, we're releasing this footage as a special bonus. Another one not to be missed! Fiona Ryan Set Tour: Another look back to the shoot, this video features a short tour of the set, in which lead actress Fiona Ryan takes us around the film's main location and introduces us to the cast and crew in her own, inimitable style. So, there you have it – what you can expect, and roughly when you can expect it! With any luck there will be one or two further surprises along the way, but hopefully this is enough to get you excited for now!